The Singularity is described as the moment when “[…] humans will multiply our effective intelligence a billion fold, by merging with the intelligence we have created.” It is forecasted to happen in 2045 and coined by Ray Kurzweil (link). Kurzweil, amongst other things, co-founded the Singularity University in 2008 together with Peter Diamandis. 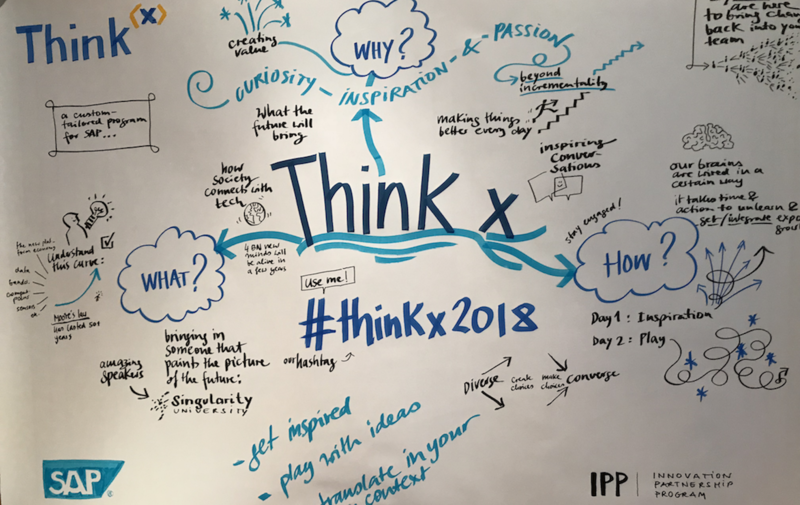 It is a think tank focused on spending time to imagine the world not in one or two years, but in 10 years based on exponential technologies and progress. While predicting the distant future is quite difficult, thinking and preparing for likely futures makes a lot of sense. Especially manoeuvring a big ship such as SAP requires some look-ahead. This necessity becomes more obvious when you consider the fact that the performance/price ratio of technology is exponential and the average lifespan of an S&P 500 company decreased from 67 (1920’s) years to 15 years today, meaning that 40% of the S&P 500 will disappear from the list within the next 10 years (based on David Roberts’ presentation). As Bertram Schulte, who welcomed us the first day, explained it is about looking beyond the next quarter, rising curiosity and passion, getting inspired, and taking ideas home to translate them into our SAP’s context. To make this happen, SingularityU was invited to SAP the second year in a row. Fortunately, I got a ticket to participate this two-day future thinking conference. Now, I am going to share some insights and impressions with you. Have you ever thought about the fact that Uber disrupts the Taxi market without owning a single vehicle? Or Airbnb disrupting the Hotel market without owning a single real estate? Or Alibaba and Amazon disrupting the retail market without having own inventory – alright, to be fair, Amazon’s game is extending with their Amazon products and opening stores but you get the idea. The point is, they built platforms and earn money to provide this platform to others who use it or build upon it. Disruption comes in unexpected forms and it usually comes from outside the company. Unexpected, because in the beginning the new companies have cheaper or very specific products but which are usually worse than the existing ones. So, the existing players do not take it seriously and do not compete with it, leaving the new company enough time and space to grow – until it is too late. Neither Netflix nor RedBox are even on the radar of competition. – James Keyes, CEO of Blockbuster (2008). Blockbuster went bankrupt 2010. From outside the company, simply because the inner company does not want to change and, even more, attacking new ideas like a company’s inherent antivirus system. Roberts says that this is usually done by the middle manager level. The upper managers, so Roberts, have the will to change and do things differently but if they do it without the backing of the middle management, they go into one direction while all others go into another one. The employees below mid-level managers are simply not powerful enough to change anything on their own. Roberts told a story about Amazon where an employee pitched the idea of AWS directly to Jeff Bezos (Amazon’s Founder & CEO). Bezos liked the idea very much whereas the rest of the company did not because it did not have anything to do with retail. Bezos not only protected the idea but also put a system into place: whenever someone goes to a manger with a great idea and the manager says No!, the manager has to write a 2-page essay why he did so and has to publish it into the intranet where everybody can read it. Saying no is easy, justifying it not so much. As a side note, SAP Exponential Strategist Vahid Khamsi claimed the decision not going into infrastructure 2010, because it was seen as dead business, as being one of the biggest strategic failures of SAP. In general, it is a lot about the company’s culture. As an example, Roberts showed a video taken in South Africa’s Kruger National Park (link) where lions attack three buffalos and catch the kid. After some mingling with a crocodile about the kid (they felt into water during the hunt), the buffalos come back with the whole herd and one buffalo starts to chase the lions which gives the other buffalos the confidence to do the same. In the end, they get the kid back! Roberts related this to company culture. If the culture is so that failure is punished or disgraceful (e.g. when the chasing buffalo were killed by the lions), other employees watching this (the buffalo herd) are feared and do not want to do the same, so they don’t try new things. Whereas in a culture where failure is okay and trying out new stuff is encouraged, other employees feel comfortable and empowered to do the same (the chasing buffalo was successful and the others joined)! It is a culture of allowing failures and standing up against ideas that you feel are wrong and are just power-played. Roberts explained further that managers are not necessarily the leaders within a company and that being a leader and being a manager are different roles, where the manager role is more about administrative stuff and the leader role more about making others follow them and bringing them to work towards the same goal. Employees listen to leaders and trust them. The crucial thing is about getting the bystanders on your side, those who were not involved before to break the triangle perpetrators, collaborators, and victims. In the past, I occasionally came in contact with investors & startup incubators over a coffee or at one of Berlin’s numerous tech events and they always told me that team is key. That VC’s don’t necessarily invest in the ideas as they might pivot over time but in the people forming a team, because eventually they will find an idea that pays out. Vice-versa, if you have a great idea but a bad team you will very likely fail and making a bad team to a great team is difficult and unlikely. So, you rather go with a good team and a bad idea than with a bad team and a good idea in the beginning. Roberts, however, stated that they believe based on findings that even more important than the team is the timing. So, a mediocre team with a good idea and the right timing can come very far, further than an excellent team with bad timing (see examples here & here). Roberts left us with the notion that despite all the growth and wealth, we have to be more kind in the future. Where we use the abundance of food to feed everyone and share the results of the exponential growth more equally. Besides the food example, he gave another one: Half of hospitalization in the world stems from bad water. We could fix it with 20 billion dollars, whereas the hospitalization costs 1 trillion. Though, we chose not to do anything yet. In his talk, Roberts gave some facts about jobs lost and created due to new technology. Statistics show that new technology is creating more jobs than it destroys, underpinning this statement with the fact that the unemployment quote in Spain and Greece, with the lowest level of automation, is the highest in Europe (a current report of the WEF states that AI will displace 75 million jobs but create 133 million new ones here). He told us a story about an Uber driver he met in Denmark. This Uber driver just moved to Denmark one week earlier, did not speak Danish, and did not know any street in the city. Yet, with the help of the Uber app, navigation and translation systems he managed to land a job within one week in a country he has never been before. With autonomous cars on the horizon, however, the next level of transportation is coming and sooner than later the job taxi driver will not exist anymore. Anita Schjøll Brede stated in her talk that we need more education as you won’t get from taxi driver to AI trainer over night. China is a frontrunner in education as they just announced this year to teach AI (tech) already in high school (link). Besides the looming inequality on the dimension “people who know tech & people who don’t”, Brede focused on her talk on the still existing differences of how men and women are treated. She raised the question whether tackling this issue is an AI challenge. She gave two example. First, she suggested a system where a camera is monitoring the household and automatically analyzes to what degree the man really helps out. I guess that she gave this a little bit exaggerated example to make the problem more visible. In her second example, Brede talked about the still existing bias in the day-to-day language, such as “men help out in the household vs. women take care of the household (suggesting that the household is the women’s place and men just help out occasionally)”. She described a browser plugin which could scan the language of the currently opened text and highlights all problematic phrases, for example also to teach kids from beginning on whats wrong in todays society. As you can see, nowadays technology and possibilities can be used for a variety of tasks, also some that don’t come to your mind instantly when you hear the phrases AI or machine learning. After Brede, Mark Jackson entered the stage and gave us an overview of quantum computers (QC). 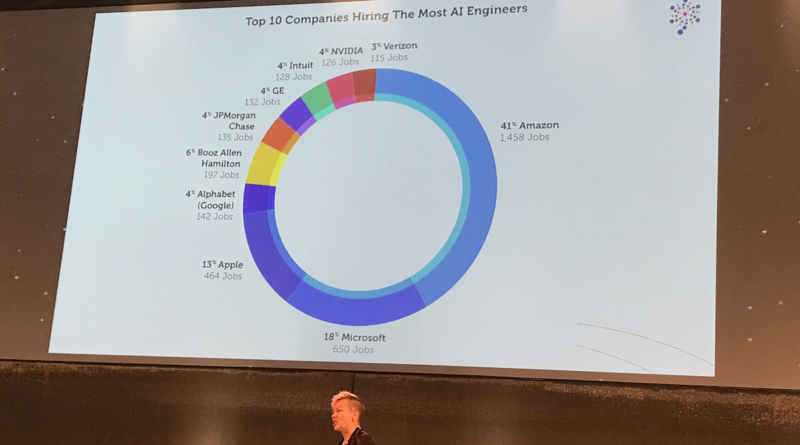 A talk about QC at such an event makes a lot of sense considering the fact that Microsoft made developing QC a top priority and that 1 billion dollars per week go into R&D in this field, as Jackson stated. Whoever wins this race first, can position itself as market leader in a huge market. Probably one of the most visible aspects affected by QC is security via encryption. QC will be able to break all kinds of encryptions we are using today quite easily due to the underlying math used. This is, of course, also an extremely relevant point for SAP and its security systems where SAP needs to adapt to the new technology quickly to prevent security breaches. With regards to a timeline, Jackson believes that within the next 5 years we will see remarkable progress and amazing things powered by QC, such as letting a QC create molecules based on provided attributes, which will help to create new pharmacies. This was also the originally problem the famous physicist Richard Feynemen had in mind for which QC could be used. Another well-known problem that could be solved via QC is the Traveling Salesmen Problem. An interesting fact to this matter was that normal computers will also be needed in the future and will still be our day-to-day tool as QC is just complementary to work on very specific problems. For the work we usually do, QC is quite bad. 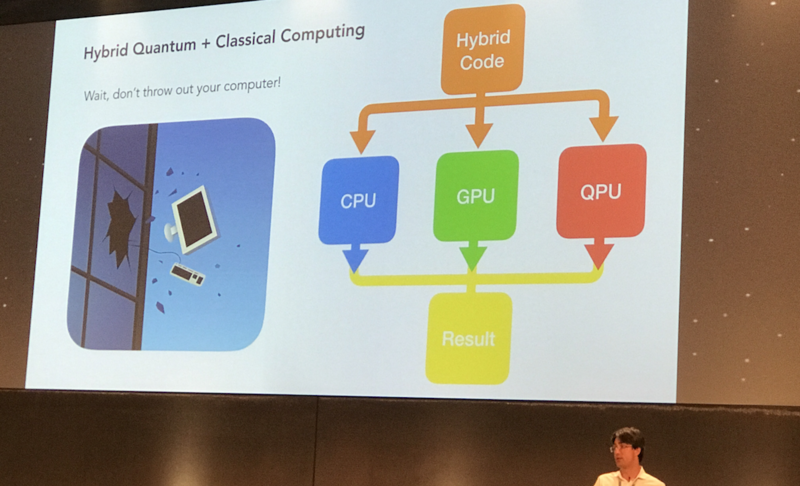 One member of the audience asked an interesting question, whether with the combination of normal and quantum computers still any np-incomplete tasks will exist. Jackson said nobody knows yet. Raymond McCauley gave us insights into what the combination of technology & biology enables us to do nowadays. I find this field super exciting as it bears a lot of potential and game changers for the human race, although it carries a lot of risks and ethical questions with it. The progress is astonishing. 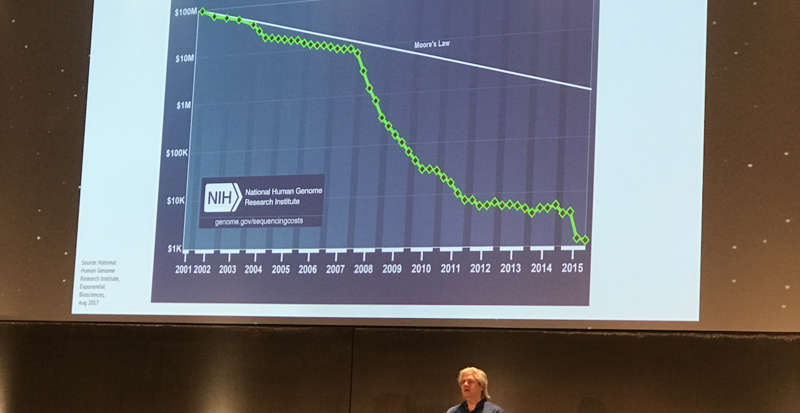 In 2002, sequencing a genome cost 3 billion dollars. In 2022, it will cost as much as flushing the toilet. We will see a big decline in cancer deaths within the next 20 years, likely starting with Leukaemia to be wiped out or, at least, heavily reduced. McCauley mentioned a few companies where everyone now can have their DNA be analyzed for quite a low budget. I was in the Bay Area last year and did a DNA test provided by the startup 23andMe (I was relieved to hear that McCauley said that 23andMe is one of the best in this field and also trustworthy, as there are some players who just ride the wave as scams. One quite popular example is Theanos as reported here). So, for $100 during the Christmas-special, I did the test and have now the information about likely diseases, can find relatives, and have a historic overview of where my ancestors came from based on my DNA. One of the most essential questions probably is: What should you do when you have access to probably the most dangerous tech the human race has ever seen? McCauley’s answer was surprising: Give it into the hands of five year olds as quick as possible to spread the word about whats possible and spark general interest. The session was 2 hours long and the idea was to think about scenarios and concepts to tackle those problems with future technology. Although 2 hours is not a very long time, the session was fun and a nice change to passive listening to the presentations. Within each session, the participants were separated into different groups. After the 2 hours, each group within the same session presented their scenario and then the groups voted for the scenario to be shown on the main stage to those of the other sessions later. I attended the Natural Disaster Relief Response session and my team was allowed to present our concept on the main stage. We imagined the role of Chris, who just became Head of the Disaster Department. He wanted to digitalize the whole setup to get rid of all the paper work. The next step was to use drones which can be quickly deployed to the disaster’s place. They give visual aid for humans but also can interact with each other automatically and leverage machine learning to analyze the images themselves. With technology such as AR and VR, Chris can also get first impressions from the location without being actually on ground. The use of technology allows a much faster response time, a safer environment, and eventually less needed humans due to automization. When the progress is far enough, maybe even Chris could retire. The 2-day conference was well organized, with delicious food, and social mingling in the evening. The presentations were great and really interesting and the Design Thinking session was fun. I heard about disruption in general and future technology such as quantum computing and the progress of digital biology. From Ruum, a SAP-internal startup, I learnt more about their setup and what the advantages of being an internal startup at SAP are. I got in contact with new colleagues and had some interesting chats. All in all, I am left with interesting impressions and stuff to think about. What are your thoughts about SAP’s future? Will SAP grow exponentially or is a disruption approaching?